Some of the most celebrated thoroughbreds (and biggest fan favorites) in recent years have all raced under the Stonestreet colors; though many of the fans seem to want to gravitate to the fillies and mares, Ms. Banke has experienced success with both sexes that has become a standard expectation whenever you see their name attached to a runner. 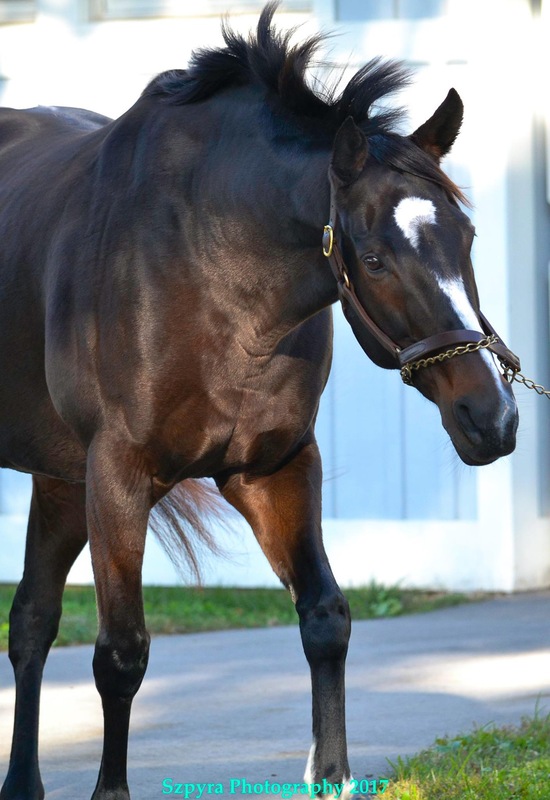 You don’t need to search too hard to find their most recent (or most successful) standard bearers, as their favorite twitter hashtag “GirlsInGold” will pull up names like Teen Pauline, Dreaming of Julia, My Miss Aurelia, Lady Aurelia, Rachel’s Valentina, and the Hall of Famer, Rachel Alexandra. It’s not an exhaustive list, but it grows every year as the farm continues to prove that they seem to have captured racing’s favorite phrase in a bottle and harnessed its secrets: “Breed the best to the best and hope for the best”. This success hasn’t been confined to America’s shorelines either, as Stonestreet has taken their show on the road to Australia, and made some noise down under, too. Stratosphere (Aus), Bounding (Aus) and teeny-tiny Oz favorite Miracles of Life (Aus) joined the ranks with the latter earning roughly $1.2 million after capturing some of her country’s most prestigious races. Though she was born on the main continent, Bounding (Aus) spent most of her time racing in New Zealand and garnered herself quite the reputation before she was retired and set to be sold at auction. With the honor of being crowned New Zealand’s Champion Sprinter and Three-Year-Old-Filly all in the same year, fireworks were figured to fly as the breeding world turned their gaze on her. Stonestreet proved victorious and purchased the daughter of Lonhro for a pretty $1,374,080 once the price tag got converted into American currency. Bounding (Aus) is now a broodmare on the farm, and the Kiwi Champion can be visited on one of their many tours (assuming she isn’t under foal watch, of course). A new face on their roster of talent this year comes in the form of Maclean’s Music’s half sister, Electric Forest. This lovely filly went unraced as a two-year-old and entered into her maiden start with high hopes from not only her connections but from the bettors as she was nicely backed for her first outing, despite not being the favorite. She’s not going to pay $7.00 to win the next time she goes to post after this dazzling effort, that’s for sure. 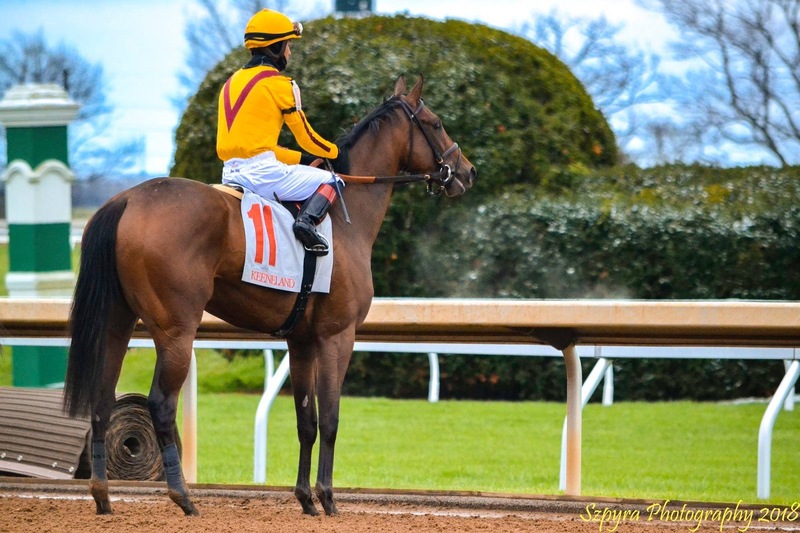 Shown above after her victorious first outing at Keeneland, she raced wide after breaking even wider and Electric Forest still managed to catch the field in the end including the daughter of multiple graded stakes winner One Caroline, named East Moon. As a daughter of Curlin, the hopes is that three year old Electric Forest will be able to improve as she goes longer distances and that she’ll be able to live up to the racing promise that her brother showed but never got to realize fully before getting hurt. Initial impressions on track proved correct, as she put on a game performance, and didn’t even look like she ran a step. In the Gr. III Stonestreet Lexington at Keeneland, the Guy in Gold almost got away with winning the race his owner sponsored as Telekinesis just got nipped at the wire by My Boy Jack, who earned himself a spot in the Kentucky Derby from the effort. This handsome son of Ghostzapper has only had three starts in his career after not racing as a two-year-old and he’s showing his promise as well with a very strong effort at Keeneland. While he didn’t get into the Derby, the gloves come off in the Preakness, and it wouldn’t surprise to see him in the starting gate, trying to spoil someone’s Triple Crown dreams. Granted, Telekinesis was not without his quirks, as he flipped over in the paddock on the day of his originally scheduled racing debut, and was promptly scratched out. I can’t imagine the thoughts going through their heads as Stonestreet watched their $470,000 purchase send his hooves into the sky right before his race. He proved no worse for wear, however, and returned to make round 2 of his unveiling a winning one, victorious by 3 1/4 lengths. Stonestreet Farm has developed a recipe for success, and it shows in every aspect of their operation: from their broodmare farm with some of the most well-bred mares residing in their stalls, to their training center, and other racing ventures as stakeholders in successful stallions or colts on the Triple Crown trail. This list includes horses like Curlin, Astrology, Carpe Diem, Dominus, Good Magic, Kantharos, Nero, Tiz Wonderful, Union Jackson, and Wilburn as some of the most recognizable names. 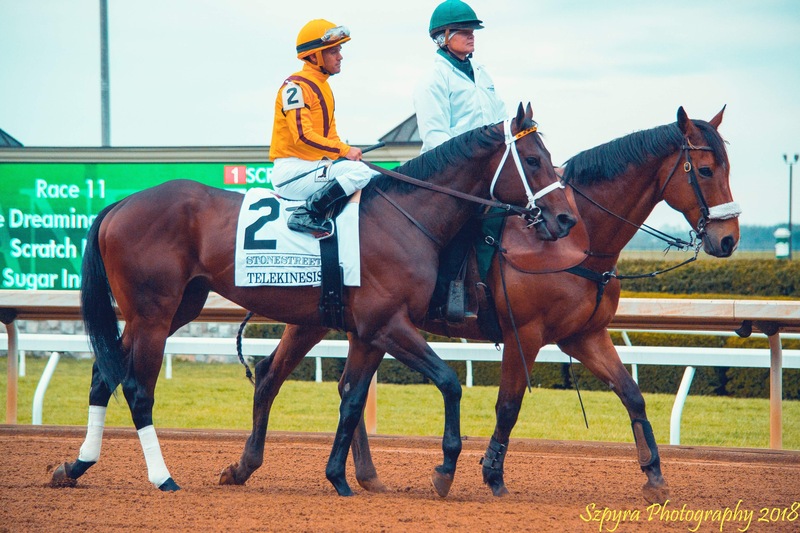 No matter what they do, you can be sure that Stonestreet is a serious contender every time one of their horses makes their presence known at the track, at the auctions, or in the breeding shed. The Girls and Guys in Gold are showing everyone else how it’s done. Great job, Pati. Keep at it. Thanks! It’s amazing how well this farm is doing after Ms. Banke originally being unsure as to whether or not she wanted to even BE in the industry. Great blog by my friend Pati.